Ahead of Sochi 2014, our culinary expert Jennifer Eremeeva teaches how to cook Satsivi - a Georgian dish, beloved in Russia and easy to find in Sochi's restaurants. Well, here we are! The Olympics are upon us, and that means I will be eating most of my dinners off the coffee table. I am not, myself, a sports fan, but I am married to a die hard Russian one, so I’m busy this month planning Sochi-centric dinners. In addition to the usual microwavable casseroles, stews, and soups, I decided to try something indigenous to the Caucasus, which can be made ahead of time, refrigerated, and enjoyed in front of the TV. Chicken satsivi meets all of these criteria, and has the added advantage of being downright delicious! 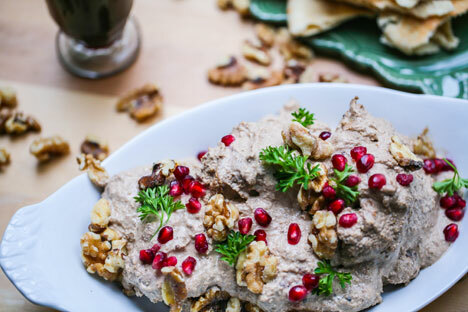 If you’ve ever indulged in a Georgian meal, then you’ve had satsivi: that wonderful, creamy walnut sauce, redolent with the flavors of Sochi’s subtropical climate and Persian-inspired cuisine. Walnuts play a big part in the region’s cuisine and they dominate in satsivi, which also features fenugreek, cinnamon, cloves, coriander, marigold leaves, and garlic. Satsivi comes from the Georgian word, tsivi, meaning “cold,” which is simultaneously a description and an instruction. When the walnut sauce is done, the final – and many Georgian cooks believe most crucial – step is to pour it over chicken and then set the dish aside to cool to room temperature. As the sauce cools, it thickens; the chicken slowly finishes cooking, and all of the succulent flavors fuse together into the unforgettable taste of one of the region’s most beloved dishes. In the Caucasus, they almost never err on the side of caution. Most satsivi recipes call for an entire turkey or several chickens, to be boiled. To bring the recipe down to three-guys-watching-hockey proportions, I substituted chicken thighs on the bone, which I always feel are tastier and easier to handle. To improve the flavor by reducing the cooking time, I brined the chicken thighs over night, then broiled them briefly at high heat until they were almost done (a meat thermometer should read about 150F), then let the hot sauce finish the job. The finished product is worthy of a gold medal! Good luck to all the Olympic hopefuls heading to Sochi! 1. Combine all of the ingredients for the brine in a stockpot and simmer for 10 minutes until the salt and sugar have dissolved. Cool to room temperature. 2. Submerge the chicken thighs into the cooled brine, cover with plastic wrap and refrigerate over night. 3. Pat the chicken dry and arrange on a rack set in a shallow baking sheet. Salt and pepper the skin side of the chicken. Allow the chicken to come to room temperature while you preheat the oven broiler to its highest setting. 4. Pound all of the dried spices except the paprika and the salt in a mortar and pestle. Mince the garlic with 1 Tbsp of salt. Combine these with the walnuts, garlic, and ½-cup of the chicken stock in a food processor fitted with a steel blade. Process for about a minute, until the mixture is the consistency of wet sand. 5. Heat the oil in a heavy-bottomed saucepan, and then sweat the onions until they turn translucent. Sprinkle the paprika and remaining ½ tsp of salt and sauté for an additional minute to let the flavors combine. 6. Add the walnut paste to the onions and toss to combine. Then, slowly add the remaining chicken stock, using a wooden spoon to scrape the bottom of the pot. 7. Bring the mixture to a boil, then reduce the heat, cover, and let simmer for 20 minutes. 8. When the mixture has been simmering for 10 minutes, place the chicken in the oven and broil on each side for 4 minutes. Do not worry if it seems underdone. 9. While the chicken is cooking, use a hand held mixture to puree the sauce. 10. Arrange the chicken pieces in a shallow serving dish, and then pour the hot sauce over them. Set aside until completely cool. 11. Garnish with fresh cilantro, pomegranate seeds, and chopped walnuts! Jennifer Eremeeva is an American writer and longtime resident of Moscow. She is the creator of award-winning humor blog, Russia Lite, and The Moscovore about all things food in Moscow. Enjoy an excerpt from her forthcoming book: Lenin Lives Next Door: Marriage, Martinis, and Mayhem in Moscow, due for publication in January, 2014.